When I relocated, I was worried about my dog flying across the country on United Airlines. As it turns out, the dogs on United get treated like VIP's, probably more then most passengers. In Canada it's different, they don't want them at all. Pet owners hoping to fly with their four-legged friends this holiday season will need to consider other transportation options as Canada's two largest airlines announce blackout periods for pet travel. No animals have been accepted for travel on either Air Canada or WestJet airlines since Dec. 15, with the ban extending until Jan. 6 on WestJet and the following day on Air Canada. The airlines blame their fur-free policies on "increased passenger and cargo loads" during the busy holiday period. For its part, Air Canada has recently tightened its restrictions on transporting animals at any time of year. From Nov. 1 to March 31, pets will not be accepted on any flights on five different types aircraft if outside temperatures dip below the freezing point, the airline says. When pets are permitted, owners are asked to make their request to Air Canada within 24 hours of booking a reservation. Flying with a furry friend costs $105 each way for domestic and U.S. flights with Air Canada, and $270 each way for overseas destinations. The issue of transporting Buster has been a sore point for Air Canada in the past few years. 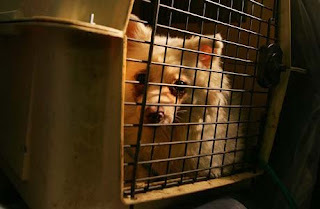 In June 2007, the airline implemented a policy that moved dogs and cats weighing less than 45 kilograms to cargo airplanes, which meant they would be on different flights from their owners. In 2008, Canadian travellers lodged 12 formal complaints to the Canadian Transportation Agency against Air Canada's pet policy. A year later, the agency ruled that the policy was unfair to pet owners.